I first heard Game Night Guys when my good friend Curtis was a guest on the show, and became a regular listener when he became a regular cohost. 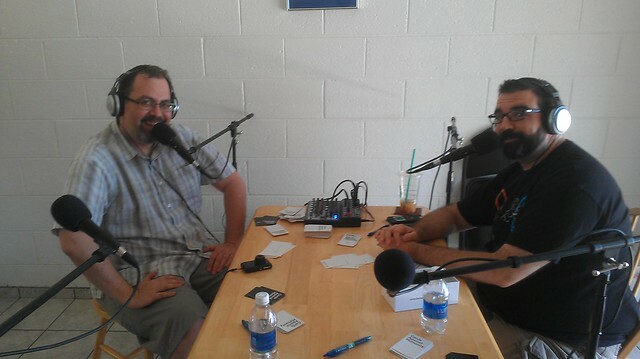 He and Brian live in Phoenix, and Garrett and I had an awesome time as guests on the show last time we were down there. This show's more about the guys than the games. They're really funny and quite good at pushing each other's buttons. And luckily for the listeners, the games they play are usually weird, old, or both. Not necessarily fun for them to play, but guaranteed to be fun for us to listen to. Speaking of which, do you have any old games to get rid of? Please consider checking their site to see if they've already played them, and sending them in if they haven't.